The research was aimed to reveal the views of parents on web-based performance evaluation program. The case study method adopted for this study. The research was conducted in the central district of Trabzon province during the fall semester of 2012-2013 academic years. A questionnaire was administered to three hundred parents and face-to-face interviews were conducted with 10 of those parents. The obtained data was analyzed through descriptive and content analysis. Majority of the parents were found to be satisfied that they could see how their children were evaluated what kind of performance activities were used as an assessment and evaluation instrument, and which scores their children achieved in those activities. However, the implementation of the study with quite a limited parental participation caused the study to remain incapable of reflecting the views on this subject sufficiently. It was recommended that web-based program should be administered to a larger sample. Acat, B. ve Demir, E. (2007). Sınıf öğretmenlerinin ilköğretim programlarındaki değerlendirme süreçlerine ilişkin görüşleri. 16. Ulusal Eğitim Bilimleri Kongresi 5–7 Eylül. Adanalı, K. (2008). Sosyal bilgiler eğitiminde alternatif değerlendirme: 5. sınıf sosyal bilgiler eğitiminin alternatif değerlendirme etkinlikleri açısından değerlendirilmesi. Yayınlanmamış Yüksek Lisans Tezi, Çukurova Üniversitesi Sosyal Bilimler Enstitüsü, Adana. Aschermann, J. R. (1999). Electronic portfolios: Why? what? how? Proceedings of the Society for Information Technology & Teacher Education. 10th International Conference 1790-1795. Bacanak, A. (2008). Fen ve teknoloji dersi performans değerlendirme formlarına yönelik oluşturulan web tabanlı programın etkililiğinin araştırılması. KTÜ, Fen Bilimleri Enstitüsü Doktora Tezi, Trabzon. Bacanak, A. ve Çepni, S. (2012). Performans değerlendirme için kullanılabilecek bir web sitesinin geliştirilmesi. 6th International Computer & Instructional Technologies Symposium, 04-06 October, Gaziantep University, Gaziantep/Turkey. Barrett, H. (2006). Using Electronic Portfolios for Formative/Classroom-based Assessment. Connected Newsletter, Volume 13, No. 2, pp. 4-6. Birgin, O. (2010). 4-5.Sınıf matematik öğretim programında öngörülen ölçme ve değerlendirme yaklaşımlarının öğretmenler tarafından uygulanabilirliği. Yayımlanmamış Doktora Tezi, Karadeniz Teknik Üniversitesi Fen Bilimleri Enstitüsü, Trabzon. Birgin, O., Tutak, T. ve Türkdoğan, A. (2009). Primary school teachers’ views about the new Turkish primary school mathematics curriculum. E-Journal of New World Sciences Academy, 4(2), 270-280. Bulut, İ. (2006). Yeni ilköğretim birinci kademe programlarının uygulamadaki etkinliğinin değerlendirilmesi. Yayımlanmamış Doktora Tezi, Fırat Üniversitesi Fen Bilimleri Enstitüsü, Elazığ. Butler,S. M., & McMunn N.D. (2006). A teacher’s guide to classroom assessment: Understanding and using assessment to improve student learning. First Edition, San Francisco : Jossey-Bass. Callı, I., Torkul, O. ve Taşbaşı, N. (2003). İnternet destekli öğretimde kullanılmak üzere web erişimli veri tabanı yönetim sistemiyle ölçme ve değerlendirme sistemi Tasarımı. The Turkish Online Journal of Educational Technology, 2 (3), 13. Chang, C., Liang, C. & Chen, Y. (2012). Is learner self-assessment reliable and valid in a web-based portfolio environment for high school students?. Computer & Education, 60(1), 325-334. Çelik, Z., (2006). Web Tabanlı Otomasyon ve Ölçme Değerlendirme Yönetim Sistemi : KTU Fatih Eğitim Fakültesi Örneği, Yüksek Lisans Tezi, Fen Bilimleri Enstitüsü, Karadeniz Teknik Üniversitesi, Trabzon. Çepni, S. (2010). Araştırma ve proje çalışmalarına giriş, Celepler Matbaacılık, 5. Baskı, Trabzon. Çepni, S., ve Bacanak, A. (2012). E-performans değerlendirme: rubrik, kontrol listesi ve derecelendirilmiş ölçek hazırlama. 6th International Computer & Instructional Technologies Symposium, 04-06 October, Gaziantep University, Gaziantep, Turkey. Çepni, S., Ayvacı, H.Ş. ve Bakırcı, H. (2012). Veli rehber materyalinin yapılandırmacı yaklaşım içinde fen ve teknoloji öğretimine etkileri üzerine bir ön çalışma. Milli Eğitim Dergisi, Sayı: 195, 131-145. Çepni, S., Şenel Çoruhlu, T., Er Nas, S. & İpek Akbulut, H. (2012). Determination of Science And Technology Teachers’ Views And Problems About Using Alternative Measurement And Assessment Techniques: A Case Study. World Conference on New Trends in Science Education, Kuşadası/Türkiye. Çepni, S., Bacanak, A., Aydın, M., Ürey, M. ve Bakırcı, H. (2012). İlköğretim öğrencilerinin ve velilerin web tabanlı performans değerlendirme programı hakkındaki görüşleri. X. Ulusal Fen Bilimleri ve Matematik Eğitimi Kongresi, 27-30 Haziran, Niğde. Çoruhlu, T.Ş., Nas, S. E. ve Çepni, S. (2009). Fen ve teknoloji öğretmenlerinin alternatif ölçme değerlendirme tekniklerini kullanmada karşılaştıkları problemler: Trabzon Örneği. Yüzüncü Yıl Üniversitesi, Eğitim Fakültesi Dergisi, (1)1, 122-141. Dornisch, M.M. & McLoughlin, A.S. (2006). Limitations of web-based rubric resources: addressing the challenges. Practical Assessment, Research & Evaluation. ISSN 1531-7714 11(3). Doulai, P., ve Stace, R. (1998). Web-Based Surveys And Assessment, ASCILITE’ 98. Conference Proceedings, 155-162. Eyal, L. (2012). Digital Assessment Literacy—the Core Role of the Teacher in a Digital Environment, Educational Technology &Society, 15 (2), 37–49. Fan, Y., Wang, T. & Wang, K. (2011). A web–based model for developing assessment literacy of secondary in-service teachers. Computers & Education, 75, 1727-1740. Foss, H. K. & Banicky, L. A. (2000). Assessing Student Learning, Delaware Education Research and Development Center, University of Delaware. Gathercoal, P., Love, D., Bryde, B., & McKean, G., (2002). On Implementing Web-Based Electronic Portfolios. Educause Quarterly, 2, 2-37. Hounsell, D., McCulloch, M. & Scott, M. (1996) The ASSHE Inventory: Changing Assessment Practices İn Scottish Higher Education (Edinburgh, Centre for Teaching, Learning and Assessment, University of Edinburgh and Napier University). Karakaya, Z. (2002), Çevirimiçi (On-line) Sınav Sistemi Geliştirilmesi ve Uygulanması Açık ve uzaktan eğitim sempozyumu, 23-25 Mayıs, Eskişehir. Lau, S., Hong, K., Lau, N & Usop, H. (2012). Web-based assessment with number right elimination testing (NRET) scoring for multiple-choice items. The Asia-Pasific Education Researcher, 21(1), 107-116. Lankes, A. M. D. (1998). Portfolios: a new wave in assessment. T.H.E. Journal, 25, 18. Lin, S.S.J., Liu, E.Z.F. &. Yuan, S.M. (2001). Web-based peer assessment: feedback for students with various thinking-styles, Journal of Computer Assisted Learning 17, 420-432. Maxwell, J. A., (1996). Qualitative research design: A interpretive approach. Thousand Oaks, CA: Sage. MEB, (2005). İlköğretim Fen ve Teknoloji Dersi (4-5 Sınıflar Öğretim Programı), Ankara. Saprıatı, A. & Zuhaırı, A. (2010). Using computer-based testing as alternative assessment method of student learning in distance education, Turkish Online Journal of Distance Education (TOJDE), 11(2), 161-169. Sabry, K., & Baldwin, L. (2003). Web-based learning interaction and learning styles, British Journal of Educational Technology, 34(4), 443–454. Wellman, G.S. (2005). Comparing Learning Style to Performance in On-Line Teaching: Impact of Proctored V. Un-Proctored Testing. Journal of Interactive Online Learning, 4 (1), 20-39. Yıldırım, A., ve Şimşek, H. (2005). Sosyal bilimlerde nitel araştırma yöntemleri, Güncelleştirilmiş Beşinci Baskı, Seçkin Yayınları, Ankara. ISNAD Bakırcı, Hasan , KARA, YILMAZ , ÇEPNİ, Salih . "The Examination of Views of Parents about the Web-Based Performance Evaluation Program in the Science Teaching Process". 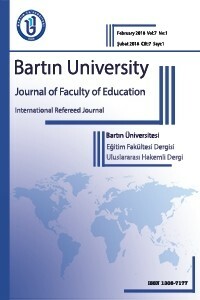 Bartın University Journal of Faculty of Education 5 / 3 (November 2016): 893-907.